A few days ago I stopped at Barnes & Noble on my way home from work. Though it was a little early in the month, I wanted to see if they had the latest issue of MOJO with its cover story on George Harrison and the cover-mounted CD Harrison Covered. To my surprise, there was a whole stack of the new issue. Naturally, I snatched it up. So even though I was looking forward to hearing Harrison Covered (which I mentioned here), it was an anticipation fraught with apprehension. I shouldn’t have been apprehensive. I’ve listened to the album as a whole four times now, and I’ve quite enjoyed it each time. First, not all of the covers are new recordings. 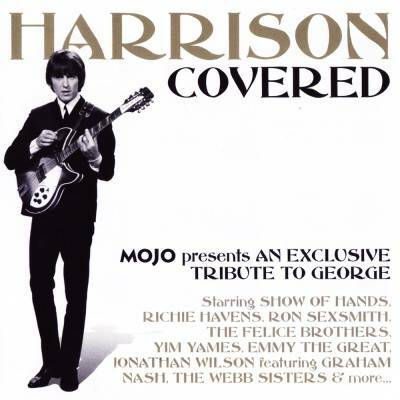 Yim Yames’ “Love You To,” which is on his Harrison covers album Tribute To…, was a familiar friend; I happen to love Tribute To…, even if it’s a depressing piece of work that is occasionally emotionally painful to listen to. Ritchie Havens’ cover of “Here Comes the Sun” is represented, too. Six of the tracks are songs Harrison recorded with the Beatles; the other nine are from his solo career, and none more recent than 1982’s Gone Troppo album. It’s an interesting mix of songs, some of the songs that one might expect — “Something,” “While My Guitar Gently Weeps,” “What Is Life?” — aren’t represented, while some more obscure material — “That’s the Way It Goes,” the underrated gem from Gone Troppo — appears. Harrison’s spiritual side is covered — “Give Me Love (Give Me Peace on Earth)” (coincidentally, the number one song on the charts the day I was born), “Long Long Long,” “My Sweet Lord” — but his sillier side goes unremarked; there’s no “Apple Scruffs” here, no “Pisces Fish,” no “Wreck of the Hesperus,” and certainly not “The Pirate Song.” The oddest inclusion might be “All Those Years Ago,” covered by Emmy the Great, who does a top-notch job with the song Harrison wrote as a tribute to John Lennon after his murder. Among the songs I like on the album are the aforementioned “All Those Years Ago” from Emmy the Great, Alessi’s Ark‘s “The Ballad of Sir Frankie Crisp (Let It Roll),” Joe Brown’s “That’s the Way It Goes,” and Jonathan Wilson and Graham Nash’s “Isn’t It a Pity?” Hurray for the Riff Raff also does something fun with “My Sweet Lord,” incorporating a little bit of The Chiffons’ “He’s So Fine” into the chorus. In short, I’m quite happy with Harrison Covered, and it’s not one of those MOJO CDs that I’ll file away and forget in six months.